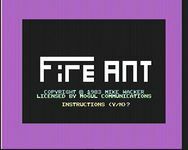 Fire Ant is an arcade puzzle game for the Commodore 64, release in 1983 by Mogul Communications, and later ported to the Amstrad CPC. The player controls an ant who has to rescue his queen from evil scorpions who have taken her captive. The game is played on maze-like screens where scorpions are wandering around and the player must navigate the ant while avoiding the enemies. The game is essentially an "observational puzzle", where the player has to experiment with various gadgets to get to the screen exit, and the queen is located in the eighth room.